This attractive and cleverly structured guide gives walkers ten of the finest walks on the high mountains of the Snowdonia National Park in a popular pocketable format. With clear information, an overview and introduction for each walk, expertly written numbered directions, large scale Ordnance Survey maps, superb, eye-grabbing panoramic photographs, and interpretation of points of interest along the way, these guides set a new standard in clarity and ease-of-use. Featured walks include: The Carneddau, The Glyderau, Tryfan, Y Garn, Snowdon, Moel Siabod, Moel Hebog, Rhionog Fawr, The Arans and Cadair Idris. 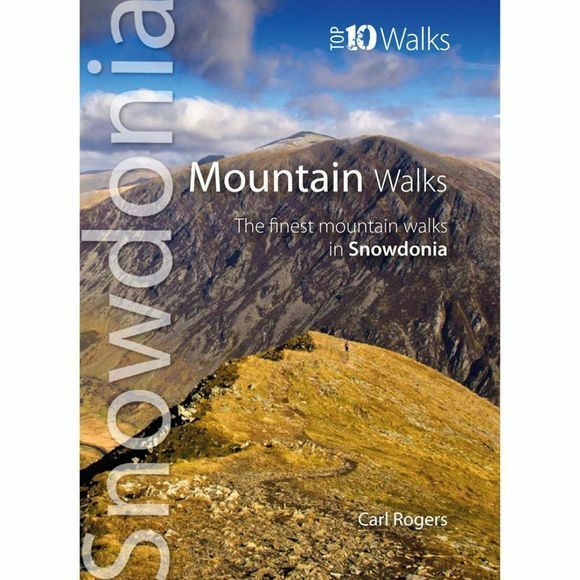 One of a series of six books for Snowdonia in the popular Top 10 Walks series. Handy, pocket-sized, full colour walking guides written by experts. Other titles in the series include: Ridge Walks and Scrambles, Hill Walks and Easy Summits, Woodland Walks, Walks with History and Pub Walks. Carl Rogers is well known for his guide books to North Wales and Snowdonia. He is a pubublisher and magazine editor and is also a member of the Outdoor Writers and Photographers Guild.